Evaluated as espresso. Juicy, buoyant, bright. Pineapple, sandalwood, cacao nib, magnolia, rose in aroma and small cup. Lightly syrupy, satiny in mouthfeel. Flavor consolidates and layers in a sweet, cocoa-toned finish with a continuing hint of pineapple. Delicate and crisp in three parts milk: sweet cocoa and flowers. 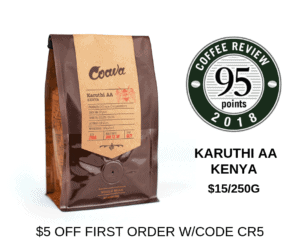 The green coffee contributing its distinction to this single-origin espresso is produced by innovating Gesha Village Estate in southwestern Ethiopia from trees of the local, indigenous Illubabor variety. A washed coffee, meaning the soft fruit residue was removed from the beans before drying. Plat Coffee is a specialty roaster and café in Hong Kong. For more information, visit https://www.courage18.com/. The Bottom Line: A light-footed, exhilaratingly bright and juicy espresso, complex as both straight shot and in short milk.